Three decades is a long time to wait, but Doctor Black Jack has finally reached the shores of North America. Osamu Tezuka's most popular adult manga, and his second most popular manga ever (behind Astro Boy) has for a long time been missing from the shelves of American bookstores. In 2008, manga fans here in North America could finally feast their eyes on the timeless masterpiece that is Black Jack. 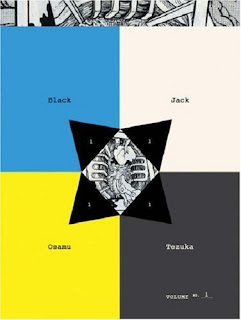 As with most Tezuka comics, the story of Black Jack is quite simple. Doctor Black Jack is an enigmatic surgeon-for-hire, a man without a medical license who charges exorbitant prices for his work. The price is worth it, however, since Black Jack also happens to be the greatest surgeon the world has ever known. He wanders the world taking any job that comes his way, with only his assistant Pinoko at his side. In Black Jack, Tezuka  known by most fans for his "childish" manga Astro Boy  does a seinen manga just right. These stories are definitely not for children or the faint of heart, as they contain detailed depictions of surgery and various references to violence and depravity. Still, they are so much more than just examples of gruesome situations and the crazy solutions to said situations. Black Jack is a complex character, and while his face may seem cold and immovable, he is far more expressive than the seinen posterboy Golgo 13. Therein lies Tezuka's most resounding success in Black Jack. The title character wears all black and has a scarred face, but he is not a jaded man who has turned his back on the world. At times he will take jobs without payment, risk his life for the sake of a patient, or even fall in love. The dichotomy between Black Jack's image as a heartless mercenary and his true identity as a caring, thoughtful person forms the backbone of each of his stories. And what stories they are! In one, a man is diagnosed with a face-sore with its own personality that seems to quell his own murderous addiction. In another a painter is caught in a nuclear blast, and calls on Black Jack to keep him alive so that he can finish his masterpiece. In one of the most important stories of all, Black Jack is tasked with removing a "teratoid cystoma" (a sort of internal Siamese twin) from an eighteen-year-old-woman. Despite the protests of his clients, the doctor saves the jumbled mass of organs and constructs a living girl out of them: his assistant Pinoko, who must live in the six-year-old's body that Black Jack has constructed for her. The artwork is pure Tezuka  stark, simple, and very reminiscent of the Fleischer Brothers and Walt Disney. Sometimes (especially when showing natural backgrounds or medical scenes), the versatile artist will lapse into the beautiful, dense artwork that readers might recognize from his masterwork Buddha. Of course, Tezuka's simplistic character designs have always been the groundwork upon which all of manga is built, and the incredibly expressive characters of Black Jack are no exception. Despite Vertical's ugly, difficult-to-read cover design for the first volume of this series, Black Jack is a fantastic read, perhaps the best one manga fans have gotten in 2008. Tezuka's classic should have been here a long, long time ago, but that takes nothing away from the magnificent yet subtle power of this enduring work.